Going trick or treating in a scary costume is not the only way to celebrate Halloween. Why reduce the occasion to just an evening of fun, when you can get into Halloween spirit (pun unintended) days, if not weeks, ahead. Yep! Although it’s only October, it’s Halloween that officially sets us in holiday mood. Regardless of the status of your job, the economy, swine flu and other issues, celebrating occasions and holidays is a great way to keep yourself motivated and positive. Everyone knows that Halloween customs were initially adopted as a way to scare away spirits that visited the earth. Whatever the true reasons may be and whatever version of the story you like to believe in, a little fun never harmed anyone. Besides, going trick or treating with our kids once a year may be the only opportunity for some us to even meet our neighbors. The interesting thing about Halloween is, everybody expects you to be dressed in a costume on Halloween night. You expect to see ghosts and ghouls and witches and vampires at your doorstep on Oct 31. That anticipation shaves off a little bit of the fun associated with scary Halloween surprises. You open the door, you see a ghost, you smile and head for the candy tin. Where’s the fun? The element of shock? The surprise? So this Halloween, try something different. How about a harmless prank played on your neighbor? (harmless being the operative word!) Maybe his newspaper disappears mysteriously a few days in a row and in its place he finds a …let’s see….a picture of a skull? Ok, maybe that’s lame, but you can definitely come up with something cleverer. The point is to let the fun begin a few days ahead, in preparation for Halloween. And one terrific way to do that is with Halloween Cards. Our selection of Halloween ecards are great for reminding people of the upcoming holiday and to send a little spook their way. But even better are free photo ecards or halloween printable cards. You can’t possibly make it to every costume party at your friends’, colleagues’ or relatives’ places. But you certainly can send a photo card with a picture of you in a costume to everyone. And for that, you don’t have to wait until Oct 31. You can start today. Simply get into a costume, get yourself photographed and you’re on your way to sending your friends and family a free Halloween photo ecard. Try it. And let us know how your friends liked it. We here at Got-Free-Ecards are constantly trying to improve the service we provide. So many people have fallen in love with our free ecards and free animated ecards, that we’re adding a brand new feature: totally interactive, completely customizable photo ecards, that you can print out at home, using your own printer! Like most new things, though, even though this feature is incredibly easy to use, it may seem a little daunting to the first-time user. But if you check out these handy, step-by-step instructions, you’ll be well on your way to creating your own homemade printable ecards. And remember: like everything else here at Got-Free-Ecards, this feature is absolutely free, and there’s no registration necessary! First, of course, you need to point your browser to the photo cards website. Once there, you’ll see all the different categories of cards you can make, from simple Christmas and Birthday cards, to Thank you cards and everything in between. Pick your occasion, and on the next screen, you’ll see a list of templates. Pick your favorite design, and click on it to go to the template. On the next screen, you’ll see your chosen design, along with a “dummy” photo, that you’ll be changing in just a minute to your very own photo. If you rest your cursor anywhere on the image, you’ll see a list of options pop up. You can choose to zoom in and out of your photo; you can rotate the image; and you can even click to choose the best fit for the space available. For now, though, click the “Upload Photo” option. After the system is done loading, you should see your photo on the screen, in place of the dummy photo. Now it’s time to zoom, rotate, and fit the photo, until it suits you just right. Now, below your photo, you see the text box? We have some pre-loaded messages, each of them holiday specific, but you can customize these, as well. If you hover your mouse over the text box and hold down your mouse button, you can drag the text box anywhere you want it on the screen. And if you click inside the text box, you can change the message itself. Just delete and type! Now it’s time to edit your font. Using the options near the bottom of the screen, if you highlight your text, you can choose the font color, the style (as in bold or italics), and if you want the font itself to have left, right, center, or justified alignment. Now, there’s one more important step: click print! Yep, that’s right! You’re done! I don’t know about you, but I sure miss picture post cards. When I was growing up, thanks to my dad’s job, we traveled and moved a lot. Somehow, I developed a fascination for picture post cards. I would collect postcards wherever we went and mail at least a few out to my close friends. The idea that by sending them a picture of the places I visited or lived in would somehow bring them closer – stuck with me. I enjoy receiving postcards too. I love reading the little caption below the picture that describes the spot and love learning about the experiences my friends have had in that place. Sadly, nobody sends picture post cards anymore. At least, nobody I know. It’s so easy to call someone, text them or catch up over IM, Facebook or Twitter that picture postcards seem like too much work. Besides, who’s got the time, right? But, there is something special about seeing a message accompanied by a photo from a loved one and for a moment – being transported to where they are, even if only in thought. Since picture postcards started fading away, I think the closest thing to replace them are photo ecards. Like this one. 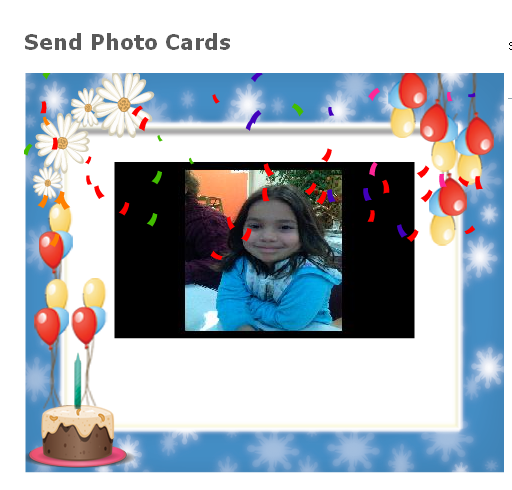 Here, you can simply choose an ecard template, attach a picture you’ve just taken and send it instantly to your friends and family. In some ways, this is even better than picture postcards, because you get to send an actual picture of you from the place you are visiting and do it within seconds. So one minute you could be standing next to the Statue of Liberty and the next minute, your friends across the globe would have received your photo ecard! An ecard and a photo wrapped in one – what a cool way to send your summer vacation pictures to friends and family! And don’t forget, Friendship Day is Aug 2nd. So, go ahead and send a photo card to your best friends no matter where they are. If it’s a picture of you standing atop the Statue of Liberty, even better.